Relentless bullying can make even the most strong-willed of kids want to curl up under a down blanket and spend the rest of day thinking about how cool it would be to live in a submarine because fish, at least, seem like pretty reasonable and accepting creatures. Some people (ahem, comedians) develop witty coping mechanisms to deal with bullying, while others emerge miraculously out of their awkward adolescent chrysalides to become the beautiful celebrities who are always going on about how awkward they were in high school. There are those who are literally bullied to death, and now there are those kids who are getting a strange opportunity to erase the object of their peers' taunting with plastic surgery. CNN profiled a 14-year-old girl named Nadia Ilse, who said her "elephant ears" (her ears stuck out a little, the way I presumed every pre-adolescent's did at some point) made her an object of relentless "Dumbo" taunts. She'd begged her mom for an otoplasty (an operation, for all you people who eschewed Nip/Tuck, to pin the ears back) since she was ten, but was, until recently, unable to get the surgery she so desperately wanted. A charity called Little Baby Face Foundation that provides free corrective surgery to children with facial deformities (think cleft palates) offered to give Nadia her ortoplasty. The charity flew Nadia and her mother from their home in Georgia to New York, where Nadia not only had her ears pinned, but also had a rhinoplasty (reduction of the nose) and a mentoplasty (altering the shape of the chin), which all-in-all constituted about $40,000 of surgery. Nadia summed up the results of her surgery thusly: "I look beautiful, this is exactly what I wanted, I love it." What would you expect her to say? A teenager that gets an opportunity to have all their least favorite features erased, buffed-out, or glossed over pretty much gets to have their deepest insecurities put to rest. Though she understands (or professes to understand) that the bullying may not stop, and admits that she should have learned to accept who she was pre-surgery, Nadia insists that the bullying would have never ended, so if her circumstances weren't going to change for her, she was going to to change for her circumstances. As part of the procedure, Nadia still has to complete a counseling course aimed at helping kids cope with the psychological scars of bullying. Little Baby Face board member Don Moriarty says that surgeries like Nadia's give kids "newfound confidence," which may be true, but it's still only a confidence that's skin-deep. 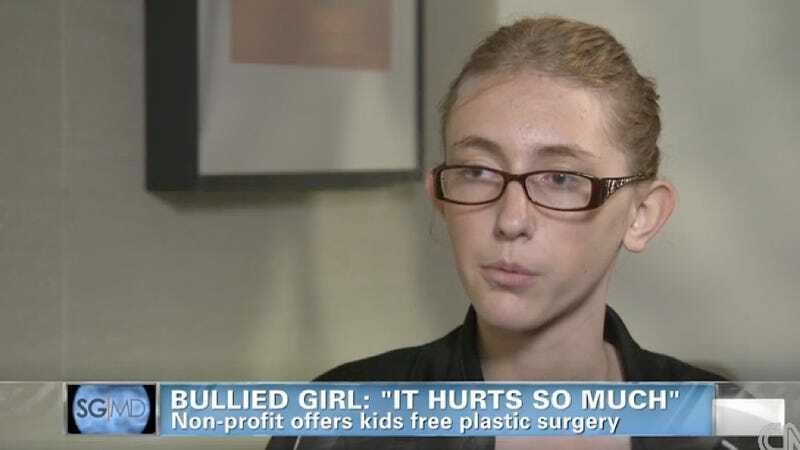 No kid should have to face a daily gauntlet of bullying, but neither should anyone as young as 14 — someone, by the way, who hasn't really started to grow into her own features — resort to plastic surgery. Then again, where do you draw the line between what seems clearly to be a debilitating, plastic surgery-worthy procedure (cleft palate, for instance), and what is merely adolescent anxiety? It's not so easy to tell someone who's being verbally tortured everyday that, in a few years, they're just going to "get over" all the anguish that their appearance causes them.